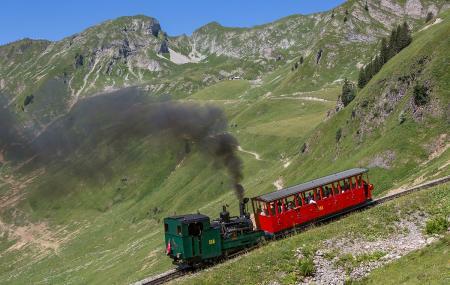 Brienz Rothorn Bahn is a steam operated train that will take you around the city in grand style. The train is about 122 years old and takes you on top of the Swiss Mountains. The ride is a fun adventure which you can enjoy with family and friends and is a great way to explore the whole area. The train takes you up the mountains where a spectacular and stunning view awaits you. A one of a kind attraction, the train has been very popular among tourists for its splendour and historic importance. Single booking is not possible. Only 2 motorised vehicles can get on one train. There are discounts for children. Discounts for groups are also available. The ticket price mentioned is for one way only. Return tickets are also available. Timings can vary depending on the season and is best to be known locally. Trains from Planalp are available which will get you close to the station. How popular is Brienz Rothorn Bahn? People normally club together Giessbach Waterfall and Lake Brienz while planning their visit to Brienz Rothorn Bahn. The best option, in my opinion, is to take the “happy hour” deal late in the day. You only go about halfway up, but it’s SO much cheaper. You will still have beautiful views, and the little restaurant at the stop has some of the best cheese I’ve ever eaten. The cows it comes from are mooing a few meters away! Did I mention this comes with free beer? We took a half day trip July 2018 off course with steam. Impressive 15 manufactured steam operated locomotives in 3 variants. Max 100 people per train each with 2 carriages. Very slowly 7,5 km / one hour to the top at as much as 25% inclination. Either 150 liter diesel fuel or 400 kilo coal to heat up max 1.200 liter of water. All very impressive. Great experience (mainly the view). Make sure you be there early (no reservation possible for single seats. CHF 92.-/adult, return ticket (full price). Very nice trip with a steam engine to the top, The ride itself take's a while! Its a nice long trip with a amazing vieuw over the lake and the other side of the mountain! It's a joke. The bahn is too slow - 12 km per hour and it takes an hour(!!) to go up. The tickets are very expensive and it's a real waste of time. Don't do there if you don't must.